Get ‘Er Done on the First One. ** “One-and-Done Pass” With Purple Books. Absolutely dedicated to schools, instructors, students, reporters, and CART Captioners. 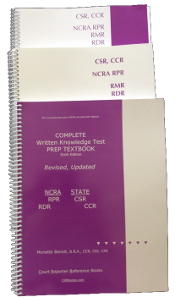 The only RPR and **RDR textbook to prepare court reporters, CART captioners, judicial reporters, students, and instructors for NCRA and State written tests, court reporting boards. Study, drill, quiz, review, understand and then… PASS YOUR TEST the first time! To order this product – Test Prep Workbook, Fourth Edition: 230 pages, $ 42.95 – 2,002 test practice questions –click on the “Buy Now” link. Material covers: Legal terminology; Court procedures and deposition rules; Grammar Glossary with Definitions; English grammar and vocabulary; Idiomatic expressions; Preposition sentences; Confusing words; Antonyms; Synonyms; Misspelled words; Medical terminology and definitions; prefixes and suffixes; and Computer technology. Monette Benoit’s materials, http://www.CRRbooks.com and CATapult CD series are wonderful for dictionary building and test prep, too. They are highly recommended by captioning companies for transitioning reporters and have been a tremendous help to me. This is good stuff, down to earth and on the level that working reporters need. 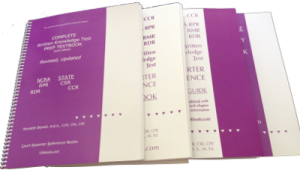 From now on, our court reporters are going to get to know the CSR, RPR, RMR Written Knowledge Test Textbook, Written Exam Workbook, and Realtime Vocabulary Workbook by Monette Benoit better than their childhood teddy bear, dragging them around everywhere and maybe taking them home to bed. You have to picture me with active children — each day. I’m always happy to give a testimonial about your products because they are all good. All my students, from way back, loved the dictation material “Popcorn Q & A” and the books: WKT CSR, RPR, RMR, RDR Text, Workbook and Study Guides. Your Handbooks are great! And the Sports ‘CATapult’ CD is fun to work on. Monette Benoit’s ’CATapult’ CDs are my ticket into the broadcast captioning arena. They are a very important part of my practice routine and have helped me immensely. The CDs are yet another example of Monette’s high quality resources that are available to help us all be better reporters and captioners. 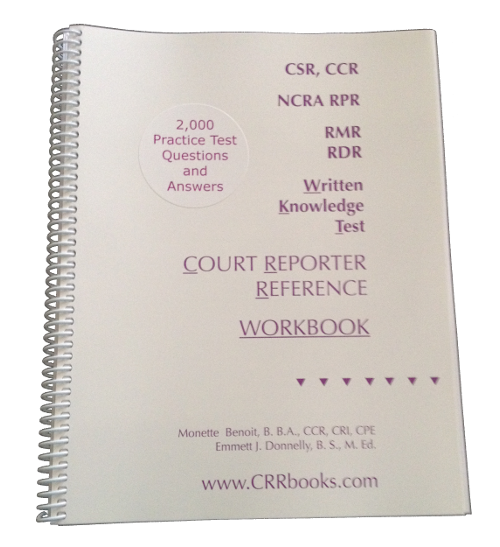 I recommend The Court Reporter Reference Text and Workbook. I give both books an excellent review! Monette has a strong desire to help the court reporting students succeed in their field. I believe her study material is a wonderful tool that should be utilized by students and court reporters everywhere as an aid in passing written knowledge tests. Thank you, Monette! You have helped me jump a major hurdle in my career!